Fun Fact: A swarm of bees in the first day or two upon moving from their original hive are unable to sting because they are holding so much honey their stinger cannot protrude past it. 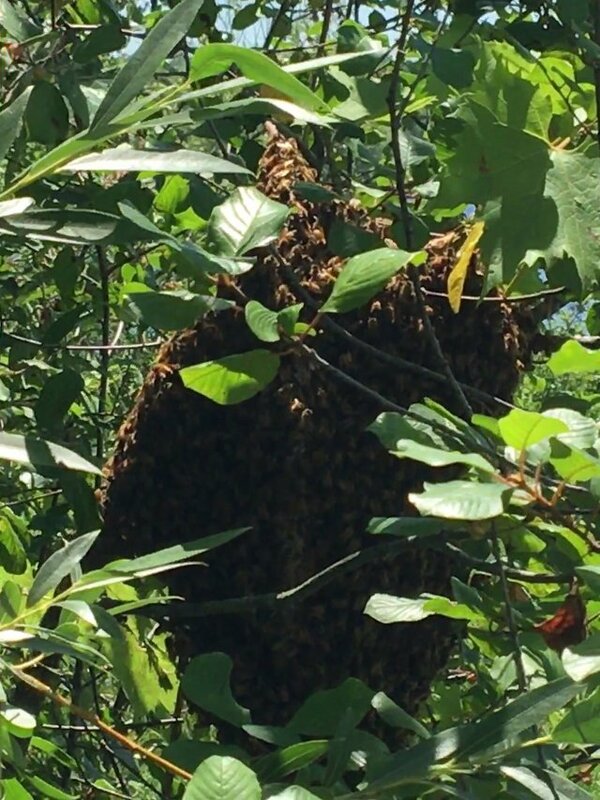 I went today on an expedition to go catch a swarm of bees. 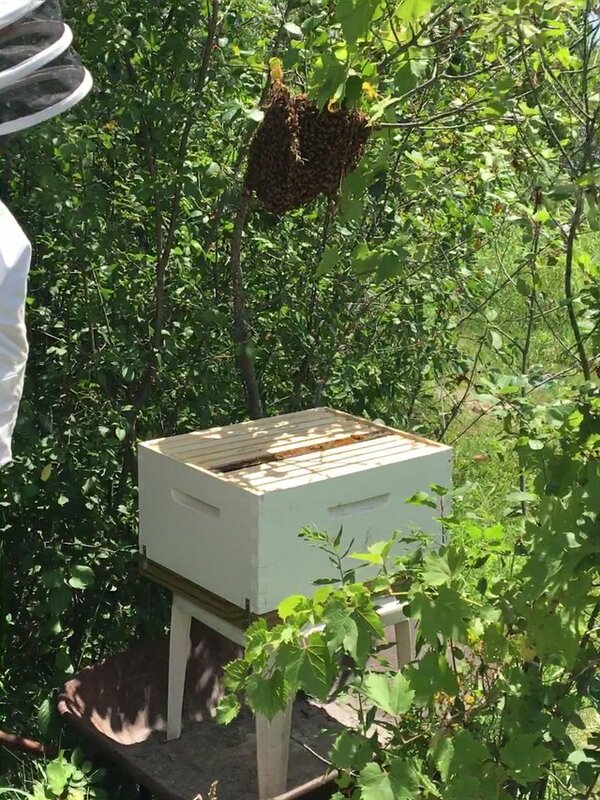 I work at a camp and we have neighbors that live on the same lake that we work at and one of these neighbors heard about our burgeoning bee program. They have been having a hard time getting to their swimming spot on the lake because they have a giant swarm of bees right on their path on the way to the water. The day after I hear about this, I head out to investigate with my friend and mentor, Dan. We brought out all our equipment and readied ourselves for some possibly agitated bees. 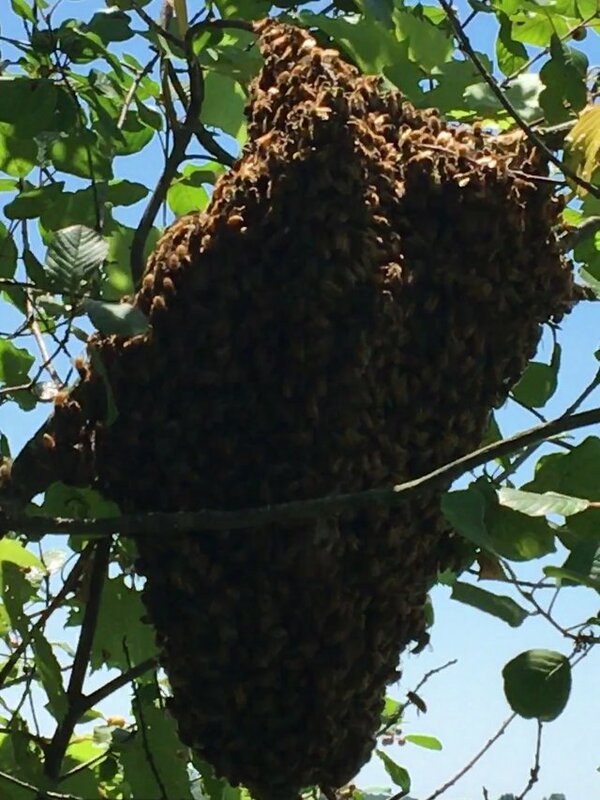 The neighbor told us that the bees had been in the swarm for a bit over two weeks. Two weeks is an awful long time for a swarm to hang out as the bees only swarm for a few hours or at most a few days before heading to a new found and closed in home. We arrive to find a giant open air part swarm part hive. This is quite unique in that the bees were actually making their swarm spot into a hive right there in the open. The colony would be doomed to be felled at the first big storm that would thrash their hive and end their lives. This would be a lost colony of bees unless we can help them into a new, protected home. The first thing that Dan and I do is clear out the section under and around the hive so that there is a nice working area. Once a lot of the foliage is clear we can get a much better look at the hive. 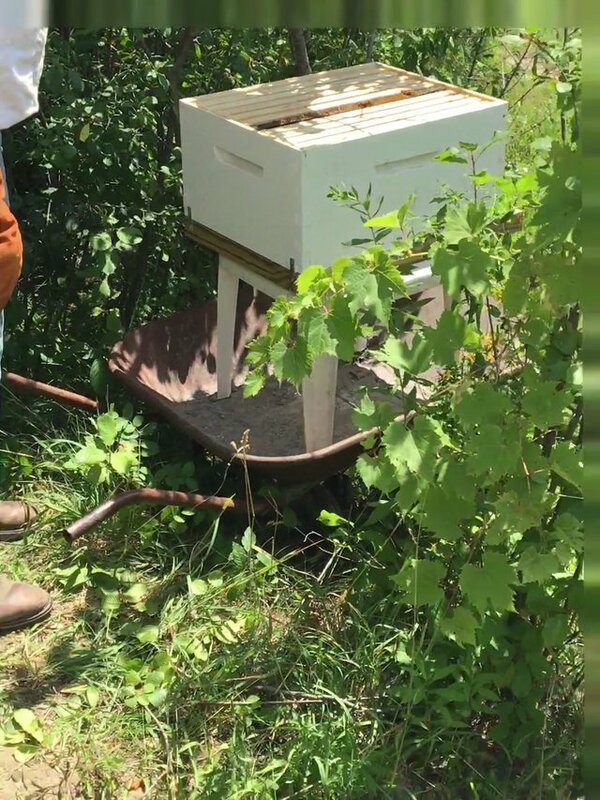 The next thing we do is rig up the hive box under the hive by using a cinder block, wheelbarrow, small plastic table, and on top of those things goes the hive box. Now we are all set up to drop the swarm into the box. One possible complication is that this swarm may act more like a hive depending on if the queen actually started laying eggs into the comb. If this is the case we will have to go about this by cutting out the brood comb and placing it in the box. This process will go much smoother if there is no brood and there is only one way to find out! The dark frame in that box that looks different than the other frames is a used frame from an old colony, it was used to hold brood (baby bees). The bees we are attempting to capture will fix up the old comb and the queen will lay eggs into the remodeled comb. Watching the bees fall onto the hive box is mesmerizing, you can hear their confused buzz and watch thousands instantly take to the air and fly around the top of the main cluster as they try to figure out what to do next or check for danger. The hope is that the queen falls onto the box and then crawls towards the bottom of the hive box where her attendants will follow her. If the queen is still up on the top cluster, the bees will all form up around her again, if she is in the box, the bees will eventually all follow her to the box. To make the hive box look appetizing to the queen, we placed some brood comb into the box. The worker bees will repair the brood comb and the queen will lay into their cells if the home is found acceptable. To make sure the queen gets into the new home, we shake the remaining cluster before they are all settled. At this point, the odds are that the queen is on or in the box…only time will truly tell. The bees will all follow the queen wherever she goes, so a swarm is only truly captured when the queen makes your new hive box into her home. After the swarm has mostly settled into the new hive box, we brush the bees off of various pieces of the old comb and branch that used to be their home and take those pieces away so they do not stay attracted to them. Now we put the top on the box so that there is only one way in or out and that is through the front entrance. All the bees should eventually be finding the scent of their queen through the front entrance and enter through it. An entrance size reducer is introduced in order to create a smaller, tighter entrance where the queen pheromone should be more concentrated. The large cloud of bees above the hive should steadily be entering the new front entrance and making it their new home. Reducing the size of the entrance helps concentrate the queen pheromone that is seeping out of the hive. This will let the flying bees know where the new home is. Something is weird about this swarm/hive. There is a small clump of bees that is clustered around a tiny tree stump that will not join with the much larger contingent in the box. No matter how we try to coax the bees they will not join the rest of the group. At this point, we will take a break until evening, when hopefully that small cluster will join the larger group. Dan and I come back around 8:30 as the sun is starting to set. We approach the hive and see that the majority of bees are in the hive and there is a stream of bees entering the hive as the field worker bees are finishing their tasks for the day and coming to their new home. Dan is a little bit distressed to see that there is still a smaller group of clustered bees on that stump and does all he can to coax them to get into the new hive, which they resist over and over again. At this point Dan hypothesizes that there may be a second queen and that this small clump is loyal to her and we may have to capture a second, much smaller swarm. As dusk hits, the activity in the hive dies down to almost zero and we stuff the front entrance to the box and lift the box into the wheel barrow. After a slow and careful trip down the path, doing as little jostling as possible, we load the hive box with bees into Dan’s truck and slowly transport it to camp where its final home will be. This is my first swarm capture. All pictures and video are my own. Oh, that is a neat thing to see. We are planning on having bees when we get our property, so it's cool to see how you could get freebies. I mean free bees. Haha. Well said “free-bees”. Yeah. Definitely helpful for us. Our next step is to build a observation hive to make it more program compatible. If you have any start-up questions when you get close to beginning, by all means, please ask them. Thanks, I'm sure there will be lots. I actually do have some questions. I put a post up with it. Sorry, this is my wannabe homesteader account. A post up with it. You could definitely call it intimidating. I was happy to be the cameraman for my first time. Although I think I will be ready to do a solo if the chance comes up soon. Glad to illuminate you on the process. Better have been one hell of a cardboard box! That's really cool man. I've always wanted to have a bee hive and I've seen this method done before. Looking forward to the update! Thanks. It’s a fun and educational process. And not as scary as it at first seems. I think you have to tag that in your tags on your actual post. You should be able to go back and edit it if you want. Fun Fact: A swarm of bees in the first day or two upon moving from their original hive are unable to sting because they are holding so much honey their stinger cannot protrude past it. Is this the reason why beekeepers never got stung by bees? Bee keepers definitely get stung...just in the case of a newly formed swarm they often do not. Beekeepers often have to rely on their equipment to keep them as safe as possible. Especially when doing things that bother the bees a bit more. Things like extracting honey, or inspecting the comb. Another fun fact...there is some evidence that bee venom disrupts or prevents arthritis. Really? Arthritis? That is interesting. I wonder what chemicals were contained in those venoms that could have exerted such pharmacological effect. That might be a fun question to pursue...some people would likely flinch at the cost of application of this research. "Who wants to get stung a bunch to lesson their arthritis?" This is really intense! One of my first summer jobs was helping with a study of honeybee dance communication. Ironically enough, I'm allergic to bees and had to keep an epi-pen around at all times. Only had to use it once! So did you get stung at all during this transfer? Neither I nor Dan got stung during this exchange, although there was a few instances where one or two bees tried. They were mostly unconcerned with us. Weird because we just shook them all from their home! @winstonalden what specifically were you researching about the honey bee dance? It’s a really interesting phenomena to watch. I would be interested in your findings. This is fascinating! I've never been around bees before (other than bumble bees), and you make a daunting task seem easy (although I am sure a lot of knowledge and experience are involved). Thanks for the detailed description! There was one really cool moment, about 20-seconds into the "Swarm Capture - Part 1" video where a bee flew right by you as you were filming! The sound of the bee's wings and the speed at which it was flying was amazing! I give all the credit to Dan, who really has been crutching me along in the process. I’ve learned so much! Yeah! That beees flew right into the lens making for a really cool moment. Made me jump the first time I watched the video.